A regular shuttle bus makes the 5 minute run between the airport and the Railway Station (less than 2 Km) - trains take around 22 minutes to and from central London. Of the London airports, this is the 2nd fastest train link after Heathrow. A new light rail link to the airport terminal is expected to be completed in 2021. National Express have bus routes to other London airports and various other locations including Cambridge, Northampton, High Wicombe, Oxford, Leicester, Nottingham, Coventry, Birmingham, and Wolverhampton. Easybus completes the journey to London Victoria in approximately 1hr 20 minutes and Earls Court in 60 minutes, the former running via Brent Cross, Finchly Rd, Bakeer St, and Marble Arch, . Terravision run a bus service to and from London Victoria via Brent Cross, Baker St, and Marble Arch priced from 15 pounds. 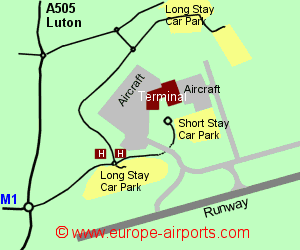 Luton airport has 17 bars/cafes/restaurants, 15 shops, 2 currency exchanges, luggage lockers, free (for 4 hrs) WiFi Internet access, and a WiFi printing service. The Holiday Inn Express is situated abroximately 500m from the terminal building, and the Ibis hotel approximately 600m. The Holiday Inn and the Hampton buy Hilton are a little further. 15.8 million passengers were handled by Luton Airport in 2017, an increase of 8% from the previous year, and it is the UK hub for Easyjet. 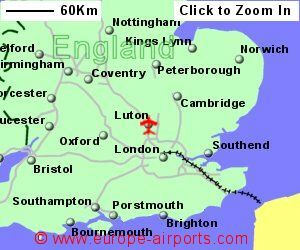 Luton Airport is the 5th busiest in the UK.